Inches away from being America's Fukushima: Nuclear plant dangerously close to being engulfed by Missouri floods. Just north of New Orleans, U.S. Army Corps of Engineers workers finally closed the final bays of the Bonnet Carre Spillway yesterday. The gates were opened weeks ago in an effort to redirect high water on the Mississippi River which threatened levees. Meanwhile, the supply of sand used to fill hundreds of thousands of bags needed to fight off the swollen Missouri River is running low after weeks of relentless flooding. It's a problem that could get worse as the river is expected to remain high through August, making it unsafe to gather sand from the easiest place to get it: the river itself. The Army Corps of Engineers is monitoring the sand supply, said Jud Kneuvean, chief of emergency management for the corps' Kansas City District. He said a ton of sand produces about 60 sandbags. Sand also is piled along weakened areas of levees to prevent seepage. 'You need lots of sand, lots of sand,' Kneuvean said. 'We probably took all the sand,' Sturm said. The local supply of sand quickly ran out after flooding began in St. Joseph, and the river was moving too swiftly to allow for dredging, Buchanan County emergency director Bill Brinton said. The county had to ship in sand from Topeka and Kansas City. Atchison also had to purchase sand from the Kansas City area, about an hour's drive away, city manager Trey Cocking said. But despite the shortage, he is refusing to raise the price. 'I can't morally in my own brain think about increasing prices because of flooding,' Emby said. The Cooper Nuclear Plant remains operating at full capacity today but the Columbus-based utility sent an emergency 'notification of unusual event' to the Nuclear Regulatory Commission when the river rose to 899 feet early on Sunday morning. The nuclear plant has been preparing for the flooding since May 30. More than 5,000 tons of sand has been brought in to construct barricades around it and access roads, according to NPPD. Should water levels engulf the facility, forcing closure and repairs, energy bills in the area would be likely to rocket to cover the cost. 'In that case we may have to raise rates,' a spokeswoman said. The Army Corps of Engineers said the river level at Brownville had surged about two feet from Saturday morning to Sunday morning and that it continued to rise because of heavy rain on the Nishnabotna River, which flows into the Missouri River from Iowa. The Cooper Nuclear Station is one of two plants along the Missouri River in eastern Nebraska. The Fort Calhoun Station, operated by the Omaha Public Power District, is about 20 miles north of Omaha. It issued a similar alert to the regulatory commission on June 6. The river has risen at least 1.5 feet higher than Fort Calhoun's 1,004-foot elevation above sea level. The plant can handle water up to 1,014 feet, according to OPPD. The water is being held back by a series of protective barriers, including an 8-foot rubber wall outside the reactor building. Its reactor already had been shut down for refuelling and maintenance since April, and it won't be turned on again until the flooding subsides. The entire plant still has full electrical power for safety systems, including those used to cool radioactive waste. It also has at least nine backup power sources. Water flooded two highways, several homes were under as much as five feet of water and there was extensive farmland flooding, said Diana Phillips, clerk and flood plain manager for the village of Big Lake. 'It's only going to get worse because there is lots of water coming in,' Phillips said. 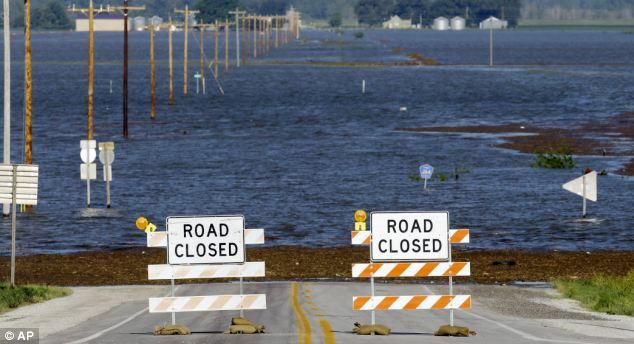 In Atchison County, where farmland was flooding, people have been evacuating for days, said Julie Fischer, a dispatcher for emergency services. Authorties have urged around 250 people in northwester Missouri to leave their homes. Jud Kneuvean, chief of emergency management for the U.S. Army Corps of Engineers' Kansas City District, said the Missouri River dipped by almost 1 foot after the Big Lake breach in Missouri but that the water started to rise again by Sunday afternoon. 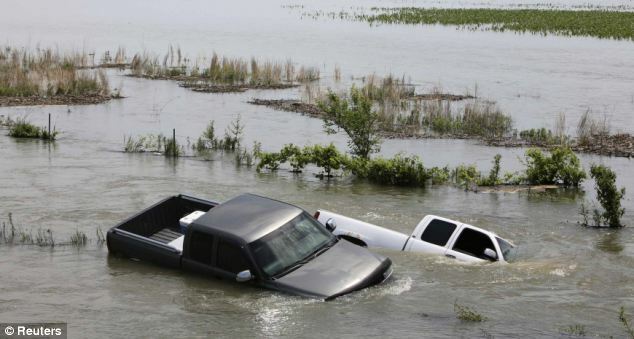 He said Big Lake is seeking permission to cut a relief hole in an already-damaged county levee to allow water trapped behind the levee to flow back into the river. The Corps increased water releases on Saturday from two dams -- Oahe above Pierre, South Dakota's capital, and Big Bend Dam just downstream -- to make room for expected potentially heavy rains through early next week. Most people left their homes well in advance of the flooding. Those who stayed were told Saturday night that water was flowing into the area. The Big Lake area, where water has been high for the past couple weeks, has experienced major flooding in three of the last five. Mike Crecelius, the Fremont County Emergency Management chief, said that in Hamburg, Iowa, the river was expected to crest at 10 feet over flood stage in the coming days. Crecelius said the river has been over flood stage since late April, and that forecasters are projecting river flows of 150,000 cubic feet (1.1 million gallons) per second through August. There was some talk this morning about more than 150,000 cubic feet per second coming out of Oahe,' said Jerry Compton, working on Sunday at a convenience store in Missouri Valley. The threat of flooding is stressful, said Compton, who knows her customers by name and even knows what brand of cigarettes they buy. 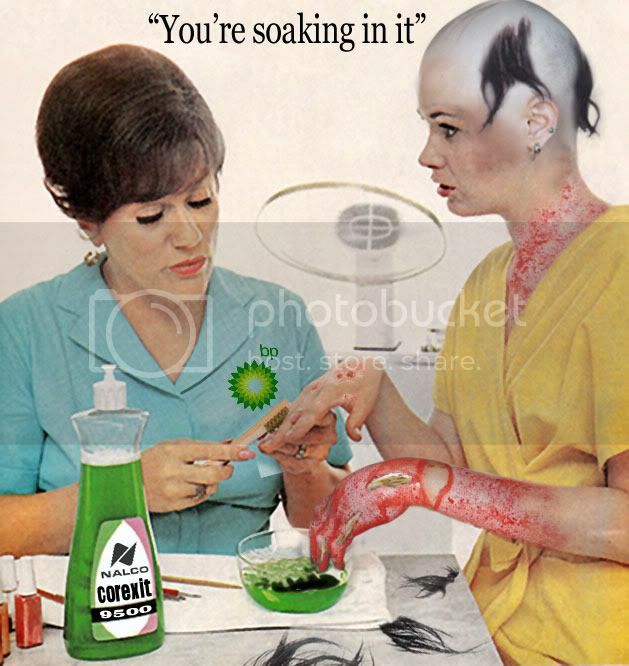 Re: Inches away from being America's Fukushima. Perfect false flag event to bring martial law in officially. There's some big marine exercise on the east coast too. And the probable ground invasion of Libya -- the east coast is a great place to practice. 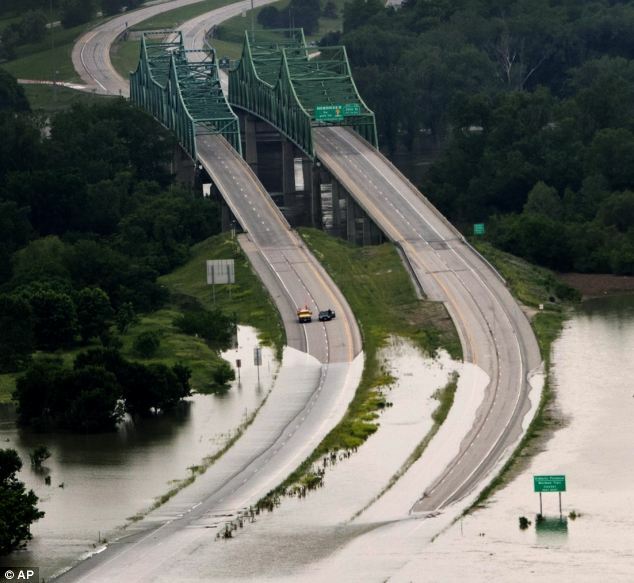 Two U.S. nuclear electricity facilities, the Fort Calhoun and Cooper nuclear plants in Nebraska, are facing the threat of rising flood waters from the Missouri river. Though safety regulators insist the plants were designed to withstand flooding and no risk of disaster exists, the Federal Aviation Administration (FAA) has been enforcing a no-fly zone over the Fort Calhoun plant since early this month, even though the plant has been shut down since early April for refueling. That may be due in part to a reportedly minor fire at the plant which temporarily knocked out pumps that inject cool water into a pool of used nuclear fuel — or it may be due to something else entirely. The FAA reportedly told “Big Picture” host Thom Hartmann that it was maintaining the aircraft ban for security reasons, and the U.S. Nuclear Regulatory Commission has insisted there was no danger to people in surrounding areas. But that still begs the question: Why would anyone build a nuclear plant so close to a river — or any other potentially dangerous region? This video is from Russia Today, broadcast Tuesday, June 21, 2011. More Missouri River floodwater is heading this way. Releases from Gavins Point Dam in northeast Nebraska will increase to 160,000 cubic feet per second by Thursday as a result of continued rain in South Dakota â€” where as much as 6 inches fell recently â€” and northern Nebraska. The corps is currently releasing a record 150,000 cfs from the dam, causing widespread flooding along the river in eastern Nebraska and western Iowa and further downstream. The higher flows are not expected to cause the river to rise significantly at Omaha, said Monique Farmer, a corps spokeswoman. The river was 5.5 feet above flood stage Tuesday at Omaha. The impact of an additional discharges will result in the river rising 8.4 to 12 inches at Sioux City, Iowa, and 3.6 inches to 4.8 inches from Omaha to Rulo, Neb. Farmer said river levees that have been hardened or heightened to defend against flows based on the 150,000 cfs releases should operate fine under the increased flows. 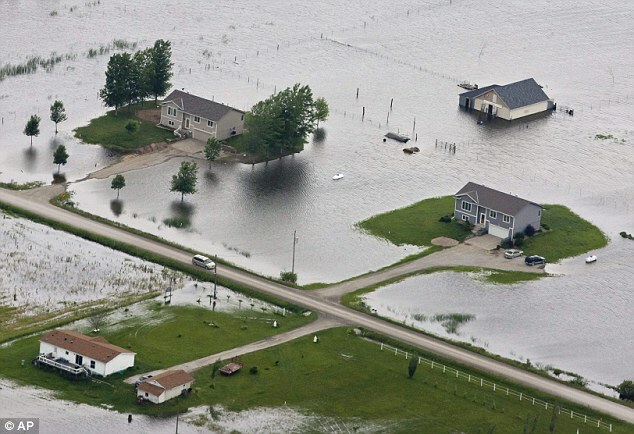 Corps officials have been ramping up releases since late May to flush historic and unprecedented floodwater out of six reservoirs in the northern plains. Officials planned to hold Gavins Point releases at 150,000 cfs for an extended period of time, said Brig. Gen. John McMahon, commander of the Northwestern Division. The corps is working with state and local emergency management teams to identify potential flood areas, provide residents with current information and help protect vital infrastructure. Flooded areas are expected to be inundated for several months. Jody Farhat, the corps water management chief in Omaha, said rainfall is once again erasing most of the flexibility designed into dam operations this year. She said the corps continues to evaluate the amount of water entering the system and will revise plans as needed. Gavins Point will increase releases by 5,000 cfs over two days. The 160,000 cfs level will be attained by Thursday and remain at that level through August. This is interesting. This website, in Egypt, has nuclear accident simulation software for sale. Out of all the nuke plants in the world, why did they choose the Fort Calhoun nuke plant as an example on how the software works?